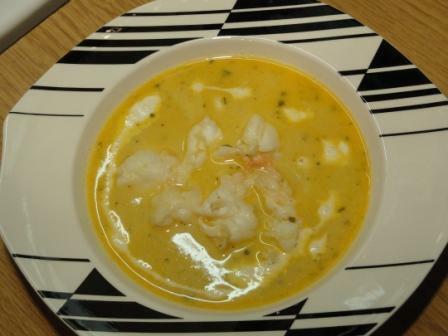 A Crayfish Bisque is a seasoned shellfish purée which is used as a basis for a soup. The shells are used to make the bisque, and the process is long and results in a small amount of purée relative to the amount of effort. You need to be patient with the initial process in order to enjoy the full depth of flavours. According to Larousse, the word ‘bisque’ has been in use for centuries and suggests a connection with the Spanish province of Vizcaina, which lends its name to the Bay of Biscay. Bisque was originally used to describe a highly spiced dish of boiled meat or game. Subsequently, bisques were made using pigeons or quails and garnished with crayfish or cheese croûtes. It was not until the 17th Century that crayfish became the principal ingredient of this dish, which soon after was also prepared with other types of shellfish. This looks wonderful, like Cin said luxurious!